Nurture field-tested and culture-friendly new hires with an internship program. There are several ways to evaluate job candidates to see if they’re a good fit for your organization (read the article on personality testing in this issue), but nothing is more cut-and-dry than a dry-run at the job. For this reason, many businesses hire interns to get a feel for a potential candidate’s aptitudes and attitude before they commit to offering a full-time position. As a result of this vetting, companies frequently offer interns a full-time position. In fact, nearly 60% of interns become employees at the end of their stint. The key is to develop a well-run internship program designed to create a veritable “talent pipeline” to ensure your new hires are field-tested and fit into the company culture. An official intern program can help you avoid the awkwardness of a current employee (or executive) trying to get an unqualified family member hired. 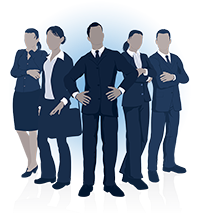 With a formal application and selection process, all candidates will start off on the same footing, and you’ll know who meets the criteria for the job. First, consider your personnel needs and motivation for seeking interns. Bear in mind that if you need more hands on deck, what you may require is an entry-level employee. Evaluate your needs accurately so you don’t expect more than what interns can provide. Most are still learning and are looking to you to gain real-world knowledge. These days most internships are paid. If you don’t offer compensation, you may exclude a large percentage of the talent pool seeking income to help stay ahead of student loans. 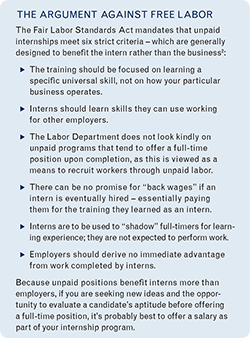 Furthermore, unpaid internship programs can lead to potential lawsuits if they do not meet legal requirements. To get started, nurture relationships with your local colleges and universities to help procure strong candidates. Work with these institutions to be sure you provide the correct documentation so your interns receive college credit. It’s important that your program keep your intern busy with lots of learning opportunities. During slow periods, set up meetings with various team members so the intern can be exposed to the different types of roles people play on a team. How much they learn and value their experience is the engine behind a strong program. Once they return to college, word-of-mouth stories will influence the number and quality of interns interested in joining your program in the future. 1 National Association of Colleges and Universities, 2012 Internship and Co-op Survey.